Joseph sent me a rough model he was working on in Maya at home. He said he wanted to stay "sharp" on his Maya skills. So I brought it into Max and started playing with VRay's SSS2 shader. 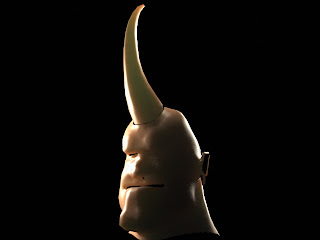 We talked about the character being a Rhinoceros Samurai. Here's a simple test. Recently, I received an invitation to design the album art for the Virgin Millionaires' new CD. We ended up going with a DigiPack layout which is more friendly to design. Here is the outside cover (front, back and inner art). I don't typically do print, but I must say, there is something about holding my work in my hand. The CD is now in stores at Best Buy and FYE. Here is an inspiring short film from JP Frenay. Artificial Paradise, Inc is an experimental film anticipating a future where a major corporation has developed an unique software, based on organic virtual reality, which holds all the lost memories of humankind. A user connects to this database of the forgotten…what is he searching for?